Atheism is the rejection of belief in the existence of deities. Atheists basically advocate evidence based knowledge and urge people to question practices or ideas that have no explanation. The entire school of thought revolves around the idea that people must cater to one another in the here and now without regarding different religious indoctrinations because such notions are often whimsical, violating scientific thinking and pragmatic functioning. In recent years, atheism has been gaining a lot of steam in different parts of the world, with more people gathering the courage to question blind belief. Yet, several others remain who know little to nothing about atheism and thus cannot help but misunderstand the entire subject and judge those who adhere by it. 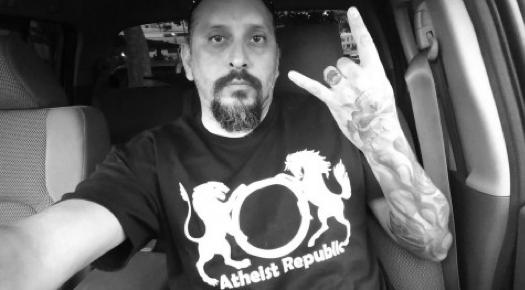 Sometimes, it is not even the lack of knowledge that leads to atheists being persecuted – it is the bizarre association of atheism with devious ideas and evil acts that leads to non-believers being mistreated by the majority. Even though atheists have come together and tried to spread awareness about their faith or the lack of it over time, there is a lot more that needs to be done. That is why, Atheist Republic thought of a unique way to share the knowledge. As part of our plan to educate more people about atheism, we thought of marketing different products with symbols related to atheism. Atheist Republic is certain that such products will help non-believers find a way to express themselves and perhaps intrigue believers to find out more about atheism. On our gallery, you can choose from many designs and in fact customize your chosen product as well. With a wide array of colours, fonts and symbols, you are bound to feel spoilt with choice. Also, if you have ideas for products with atheist symbols that you think we could possibly feature on our website, feel free to share them with us.